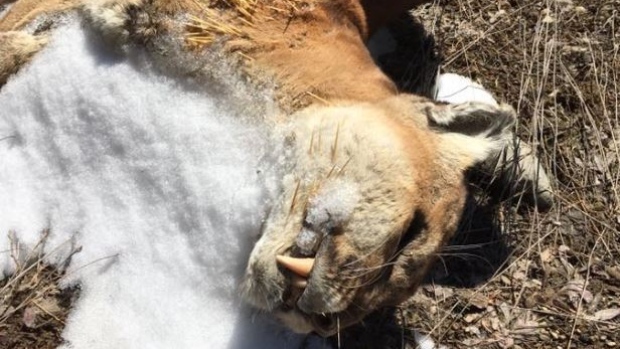 A startling discovery made this weekend north west of Thunder Bay may have answered a decades-old question about whether cougars prowl northwestern Ontario. On Saturday Mandi Weist, her boyfriend, and some buddies were exploring a sand pit area near the Boreal Road when they came upon a van that was pulled over. Weist said the group then parked their jeep to have a look. They could see it was indeed a cougar, partially frozen into a snowbank, she said. Weist said they were shocked to see the huge cat. “Honestly, we had driven by this spot before and had seen something laying there. We just figured it was a deer, based on the colour,” she said. Knowing it was an extremely rare find, the group loaded the dead cougar onto the vehicle and brought it into Thunder Bay. Weist said they knew they had to contact the Ontario Ministry of Natural Resources and Forestry (OMNRF) about their find. She said they also talked to taxidermist Dan Cavicchiolo and decided to bring the cat to Boreal Tales Taxidermy on Hwy 61, south west of Thunder Bay. Cavicchiolo confirmed to the CBC that the animal brought in was indeed a mountain lion. Cavicchiolo said the front half of the cougar that had been frozen in the snow seemed to be well preserved. He said the back half of it had more decomposition. The animal had long claws and good teeth, but was emaciated and had muscle atrophy, he said. Cavicchiolo noted that he removed between 50 and 75 porcupine quills from the cougar’s shoulder and nose, but he said there were none in the cat’s mouth. He suspects the animal “tied into a porcupine” when it was getting desperate for food. Cavicchiolo said he wasn’t always, but is now convinced that some cougars call northwest Ontario home. According to the OMNRF website, cougars are considered an endangered species in Ontario. Weist said that, on Sunday afternoon they took a ministry conservation officer to the spot where she and her friends had found the cougar. “[The CO] told us we can’t actually keep it because it is actually illegal to own a mountain lion from Ontario, because they are an endangered species,” she said. Weist said she was told the animal would be mounted and displayed for educational purposes.